The longere has 4 bedrooms and sleeps 8 adults plus children. The base price is for four people with a charge per extra person. There is a spacious living room / dining area with a large wood burner. The house has been renovated to accommodate people with mobility problems and the downstairs has level access throughout with wide doors including bedroom with level access shower. There is a large patio and garden area at the back of the house and off road parking at the front of the house. The garden area is approximately an acre in total. The house has wireless internet broadband and a phone. The accommodation is very flexible and suits couples as well as larger groups (up to 12 with the cottage). The house is centrally situated to explore the region and is an easy drive to a large lake with a beach. It is a fantastic location to meet and enjoy company but is spacious enough to find privacy when needed. The property is situated in a small rural hamlet surrounded by farmland. There is off road parking and a large garden area and patio. The hamlet of Treveran is 1km from the historic town of Josselin in the Morbihan region of France. Josselin is situated on the Nantes Brest Canal is famous for its magnificent castle and medieval architecture. The property consists of a longere and cottage in an L shape. Peaceful but not isolated the house is centrally situated and an ideal base from which to explore the Morbihan region of Brittany. The house is a short drive from a very popular lake with manmade beaches. The accommodation is flexible and suits small or larger groups of up to twelve. The longere and cottage combined sleeps 12 plus smaller children. The longere has a level access downstairs and is suitable for people with mobility problems. Wireless internet access is available. There is French and UK TV. The longere and cottage may be let separately or combined. We offer a discount for renting both properties together. About Les Moineaux: The property is approximately 300 years old and contructed of traditional Breton stone. The smaller cottage was renovated 25 years ago and the larger longere/farmhouse 9 years ago. The downstairs of the longere has been renovated to accommodate disabled access throughout with wide doors and ramped floor where appropriate. There is a double downstairs bedroom with level access shower and a manual shower chair. The longere is well insulated and there are wall heaters in all the rooms and a large wood burner in the living area. The longere has a large patio and barbecue and a grassy area. There is off road parking at the front of the house. 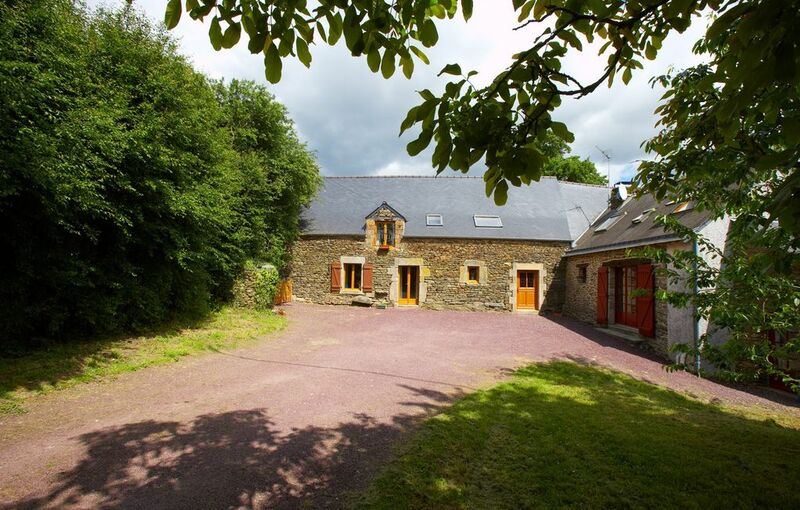 The property is situated in a peaceful but not isolated hamlet within easy reach of Josselin. For walkers there is plenty to explore around the house and the canal is easily accessible on foot. It is possible to hire bikes in the main season. The canal paths are well maintained and accessible for wheelchair users. Things to do: Josselin has many cafes and restaurants and it is possible to climb the bell tower of the church for a great view of the area. The famous castle has guided tours with some tours in English. There are accessible level walks by the canal and it is possible to hire a boat or cycles in Josselin. The nearest beach is approximately one hour's drive depending on traffic and ten minutes drive from the house is a large lake with man made beaches. The water in the lake is ideal for smaller children as it is usually warm and the lake is popular with French tourists and usually quite lively on a summer's evening. There are lots of activities and the visitors book is full of useful suggestions. There is a tourist information in Josselin. The owner made a note of the walks around the cottage and will send a PDF of walks and things to do in the area. There are a 100 well marked walks in the region and the owner has been walking them to ensure which walks are circular and which colours to follow to access the circular routes. We are in our sixties and bought the property several years ago. Peter is a photographer specializing in agriculture and I am a foster carer. We live in lovely Devon so we are lucky to enjoy some of the the best of France and England. The property is about 300 years old and built of typical Breton stone. We purchased the cottage and longere in 1998 and enjoyed many lovely holidays in the cottage. The adjoining longere was in need of renovation and starting to fall into disrepair so we decided to renovate this 13 years ago. This proved to be a much bigger project than we first anticipated. My Father was very disabled with a large wheelchair and often found access very difficult. This seemed an ideal opportunity as we were starting from scratch to make the downstairs level access with extra wide doors. The house is situated in a very peaceful hamlet but is not isolated and ideal if a member of your party has mobility problems. It is close to the lovely historical town of Josselin and the whole area is packed with beautiful historic towns to visit. We are close to a lake with beaches for swimming and not too far from the coast and beaches. There are many walks, often themed, in the area. Three of the bedrooms have a shower room with toilet en suite. The smaller bedroom is situated next to the main bathroom which has a bath and shower cubicle. The downstairs shower room has a roomy level access with a manual shower chair. Wood is supplied for each booking. There is a large wood burner which is useful in cooler evenings and winter months. Well equipped for cooking, dining and having a barbecue. The property has ramped access and extra wide doors. There is a level access downstairs bedroom with level access shower. There is a manual shower chair. Equipment such as hoists can be individually supplied via a local service through the chemists. This equipment needs to be ordered two weeks in advance. The equipment is delivered in a very clean and good condition and is very reasonable priced. There is a good selection to accommodate size and individual requirements. The house is well equipped with games and books and DVD's. There is a large barbecue on the back patio. The area is ideal for people who enjoy walking with over 100 marked walks in the area. Our second holiday in Brittany at Le Moineaux. We did a lot more exploring this time. Visiting Vannes, which is a must for any visitor. Lin and Shelagh are very accommodating and the ramp is an excellent new addition. Thanks for the review and we are glad you were all able to go exploring. We hope you return another year. Thank you for your kind review. We are glad you enjoyed your stay and hope to see you again in the future. A lovely house with all we needed for a month's stay, including disabled facilities for one of our party, which was much appreciated. It was also perfect for our little dog. Lots of grass to run about on. We very much enjoyed walking, cycling and 'mobility scootering' along the banks of the canal and found we could reach the canal path from many different access points. The town of Josselin is a treat - not too big but very picturesque and full of restaurants, cafes and creperies. We loved the Saturday market - one of the best we have been to in France. Our favourite day trip was 3 hours on a self drive boat from 'DayBoats' in La Gacilly. Dont be afraid to phone Mike who is English and book one. We would recommend at least half a day so you can reach the lake and stop for a picnic. Thanks to Sheila and Peter, our stay was memorable. When the weather was good we spent most of the time in the garden - when not so good, or in the evening, we had the luxury of the wood burning stove. We would recommend Les Moineaux to anyone. PS don't forget to feed the sparrows! Thank you so much for finding the time to write a review. We agree Josselin is a lovely old town. We envy your stay of one month - the longest we have stayed is two weeks because of work commitments. I spent a week here with my wife and two children (15 & 11). The longere is perfect - loads of space and very well equipped. It is also very tastefully furnished. Josselin is a pleasant 25 minute walk away and we walked in most evenings. It is a lovely place full of character with a marvellous chateau. There is plenty to do and see in this part of Brittany - in particular we enjoyed visiting Vannes and La Gacily - both very easy to reach. We also hired bikes and cycled along the canal - it's a real must do. We would certainly recommend this property and a holiday in this part of France. Josselin is a beautiful historical town of character situated on the Nantes Brest Canal. From this central location it is possible to enjoy the varied attractions the region has to offer. Josselin is famous for its magnificent château situated by the canal and lovely town centre with medieval 17th century timber framed buildings. The Saturday morning market brings the otherwise sleepy town to life and there are many open air cafes and restaurants. A climb up the bell tower of the Basilica will afford you a view of the whole town and surrounding area. Situated inland in the Morbihan region where the roads are quiet for exploring the countryside and neighbouring towns but still within easy reach of Carnac and Quiberron for fantastic beaches. Ploermel and Pontivy also have interesting attractions and a great variety of shops.Ten minutes drive from the house is the Lac au Duc which is a large lake with man made beaches,water activities, walks and also a golf course. This is very popular for families with younger children as the water tends to be warmer than the sea and there are no big waves. There are walks around the house and it is possible to walk down to the canal and into Josselin. I have made a PDF describing different local walks and there are local maps in the house for those wanting to venture further on foot. It is possible to hire bikes in Josselin in the main season and to hire a boat for the canal.